PRS Foundation has today announced the 19 new works, of various genres and scale, selected for the New Music Biennial 2019: a unique snapshot of UK contemporary music across two major festivals, on air and online. Absolutely Cultured is proud to be producing the Hull festival (12 – 14 July) and to be a partner in this PRS Foundation initiative alongside London’s Southbank Centre, BBC Radio 3 and NMC Recordings. As part of the programme Absolutely Cultured is producing an ambitious outdoor piece by award-winning composer Dan Jones. Following its success in Hull as part of the UK City of Culture year, PRS Foundation’s New Music Biennial is returning to the city and London’s Southbank Centre this summer with an incredible line up of artists and new commissions, as the sound of new music pops up in the most unusual locations. A unique snapshot of UK contemporary music across two major festivals, on air and online, PRS Foundation has today announced the 19 new works selected for the New Music Biennial 2019. The programme includes an ambitious outdoor piece produced by Absolutely Cultured, as well as appearances from renowned artists such as playwright, poet and novelist Kate Tempest, composer and turntablist Shiva Feshareki, Forest Swords and BAFTA award-winning composer Jessica Curry. Many of the new commissions explore the complexity of modern identities and all of the New Music Biennial commissions share an inspiring sense of experiment. The Hull festival is being produced by Absolutely Cultured and features work by local musicians including Numb Mob, alongside new commissions from local partners Opera North, Freedom Festival Arts Trust and J-Night. 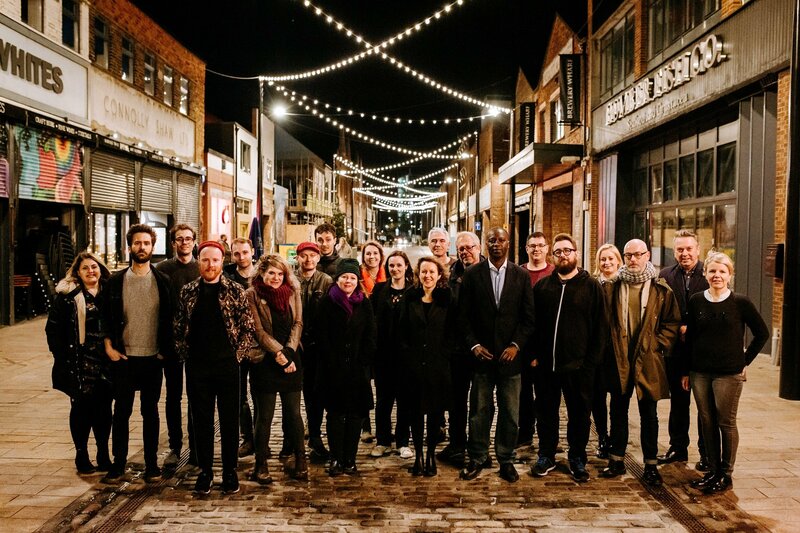 The sound of new music will be heard across the city of Hull in an array of unconventional and unusual venues, as audiences are invited into places they might not have been before. As part of the programme Absolutely Cultured is working with Dan Jones, to create an ambitious piece for Hull; part of its continued effort to create outdoor works which transform the urban environment for large audiences. The BAFTA and Ivor Novello winning composer is returning to the city after acting as the supervising sound designer for the UK City of Culture 2017 opening event, Made In Hull. More details about this exciting piece will be announced soon. The winning compositions were selected by a panel of judges, Chaired by BBC Radio 3 Controller Alan Davey and including Vanessa Reed (CEO, PRS Foundation), Gillian Moore CBE (Director of Music, Southbank Centre), Katy Fuller (Director, Absolutely Cultured) and radio presenters Kevin Le Gendre and Elizabeth Alker.. In addition to the pieces below, Absolutely Cultured in Hull will be commissioning a site specific piece, continuing its focus on outdoor works which transform the urban environment for large audiences. More details to be announced. Kate Tempest is an English poet, musical artist, novelist and playwright. In 2013, she won the Ted Hughes Award for her work Brand New Ancients and her illustrious writing career has seen her win many awards since, often combining paper releases with music and performances. Her albums Everybody Down and Let Them Eat Chaos have both been nominated for the Mercury Music Prize and she was nominated for Best Female Solo Performer at the 2018 Brit Awards. She was Artistic Director of the 2017 Brighton Festival; Kate Tempest comes to the New Music Biennial with an impressive reputation for interdisciplinary work and this collaboration with the BBC Concert Orchestra will be a rare opportunity to see her hard-hitting work performed by a symphony orchestra. Better known to some as a baritone soloist, Roderick Williams’ reputation as a composer is growing steadily. His Advent antiphon O Adonai has become something of a favourite for choirs on both sides of the Atlantic and his Ave Verum Corpus Re-imagined was awarded the BASCA prize for Choral Composition in 2016. The new commission, which will be performed at further festivals next summer, will be a new significant work for Chineke!’s jazz-inspired programme. New Metamorphosen is a commissioned work by British composer Edmund Finnis, written for Manchester Collective. Finnis’ work is a response to Richard Strauss’ masterpiece for string ensemble, Metamorphosen – like its namesake, it will be composed for 23 solo string players. In this starkly original new work, Edmund Finnis has painted something beautiful and strange, a music of close whispers and myriad reflections. New Metamorphosen will receive its premiere at the New Music Biennial, and will be taken on tour by Manchester Collective the same year to venues including the Invisible Wind Factory (Liverpool), The White Hotel (Salford), Leeds Town Hall, and Bridgewater Hall (Manchester). Following the tour, both works will be recorded and distributed, digitally, and on vinyl. Rehearsal will be a new 15 minute ballet piece with live audio-visual elements. This piece will be an extension of elements from Care, the musical Klein presented at ICA in February 2018. The project will be scored, casted and directed by Klein, with dance choreographed by Samuel Kennedy and Scout Creswick. The cast will consist of teenage boys with no prior experience of ballet or dance performance. The result will be a live dance piece with original music performed by Klein, and live visuals created by Josiane Pozi. 9Bach will make an original composition which will contain words sung in the Welsh language. Woven purposefully in to the sound, the audience will hear a spoken word piece performed in English which will voice an interpretation (or feel) of the song’s meaning . 9Bach’s six musicians will play the music, and they will add analogue synthesisers, to augment the sonic range . They will also commission a creative writer to compose the English interpretation, and an actor / artist to perform it. The piece will beautifully share music and the two languages with audiences. “Where to Build in Stone” is inspired by the shapes and sounds of the city of Hull, originally commissioned by J-Night for Hull Jazz Festival 2017. Performed with a variety of electronic and acoustic instruments, the piece is a vivid soundscape embroidered with evocative melodies that evoke a mysterious and oddly beautiful side of the city. The visual counterpart explores Hull over the course of a day, telling the story of the city through the things that are everywhere and overlooked; the familiar seen from an unfamiliar perspective. Music by Numb Mob, film by Joseph Bird.